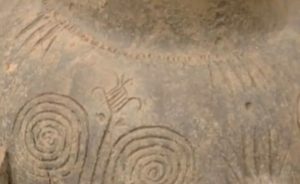 The settlement near Bulgaria’s Baley belongs to the so called “Culture of the Encrusted Ceramics of the Lower Danube”, and has been researched for over 40 years now but keeps yielding new impressive Bronze Age finds. The very necropolis of the settlement of the “Culture of the Encrusted Ceramics of the Lower Danube” in Northwest Bulgaria was discovered only several years ago by accident when local residents where building a shaft and dug up a Bronze Age grave. “By pure accident digging up a shaft revealed what we came to call Grave A. 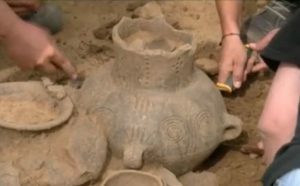 [Back then the locals] had cleaned up rather professionally the pottery that they had discovered, and brought it to the Regional Museum of History in Vidin,” narrates lead archaeologist Assoc. Prof. Stefan Alexandrov from the National Institute and Museum of Archaeology in Sofia. “Actually, that culture, those people who left behind the necropolis and the settlement near Baley, [covered the area] from the [Danube gorge] Iron Gates [between Serbia and Romania] all the way to [Bulgaria’s Danube town of] Oryahovo, with this wonderful pottery,” Alexandrov says. “That’s how we refer to them – as the Culture of the Encrusted Ceramics,” he emphasizes. “None of the vessels has a replica in terms of shape and decoration. They are all unique,” explains restorer Ekaterina Ilieva. “No gold adornments have been found in both the settlement and the necropolis. 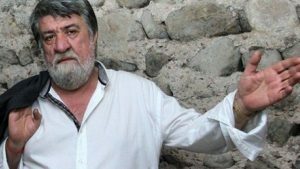 I don’t know if that’s unfortunate or not since if any had been found, perhaps the necropolis wouldn’t exist,” Alexandrov says, possibly referring to the constant raids by modern-day treasure hunters. 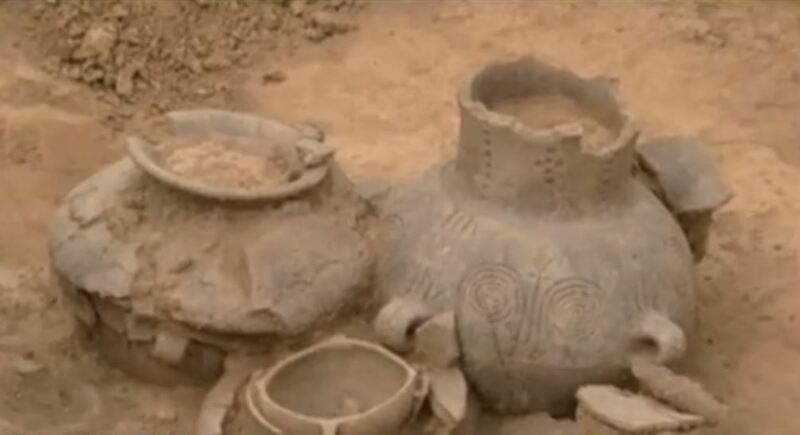 The Bronze Age settlement near Baley was discovered in 1970, and was excavated for 18 years by Bulgarianarchaeologists Rumen Katincharov from the National Institute and Museum of Archaeology in Sofia, and Ana Yotsova from the Vidin Regional Museum of History. The culture that the settlement belonged to is known as “The Culture of the Encrusted Ceramics of the Lower Danube” because of the large number of ceramic artifacts found there which are encrusted with ornamental motifs made with white paste. Even though in the 1970s and 1980s the archaeologistsunsuccessfully looked for the settlement’s necropolis, it was discovered only in 2010, exactly 40 years after the original discovery of the settlement. It was found by accident in the yard of a local home during the digging of a pit for a traditional “outside toilet” by local resident Lyubo Petrov. Petrov stumbled upon ceramic vessels, and alerted the archaeologists from the Vidin Regional Museum of History; the necropolis of the Bronze Age settlement near Baley has been excavated ever since. 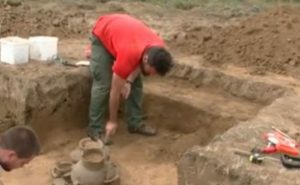 The settlement near Bulgaria’s Baley is the latest Bronze Age settlement in the Lower Danube Valley. During its excavations,the archaeologists found over 60,000 archaeological artifacts,including 60 intact ceramic vessels, and lots of bone artifacts, household items, and tools. However, the one near Baley is the only one to have been fully excavated. Most of the settlements from the extinct Bronze Age culture were located right on the bank of the Danube, and have been found when the river leveldecreases. The necropolis of the Bronze Age settlement near Baley found in 2010 is located 400 meters from the settlementitself, and 2 km away from the bank of the Danube River. Inside the excavated graves, the archaeologists have found single, double, and triple funerals. Since 3,500 years ago, the western part of the Lower Danube Valley had a huge beaver population, it has been proven that the people from the Bronze Age culture in question hunted beavers for food. They also had horses from the “European breed” which were only about 1.3 meters tall. This entry was posted in Archaeology, Art History, History. Bookmark the permalink.